So, remember just a couple weeks ago when Arsenal set the summer transfer rumor mill ablaze with their uncharacteristic, win-now bid for Leicester City’s Jamie Vardy, which threatened to seismically alter the Premier League landscape? Well, Vardy just killed all that today. Holy Hell, Are Arsenal Really About To Buy Jamie Vardy? A refresher for those who haven’t been paying attention: At the start of the month, Arsenal triggered Vardy’s £20(-ish) million release clause that was reportedly reserved for Champions League clubs—the clause’s existence coming as a shocker to the public. The Gunners had reportedly been in contact with Vardy’s people already and were led to believe that a significant pay raise on his approximately £70,000 weekly salary could convince him to leave the reigning champion Foxes and join a true English giant. Confident that their terms would prove tempting if not irresistible, Arsenal submitted an official bid to seal the deal. 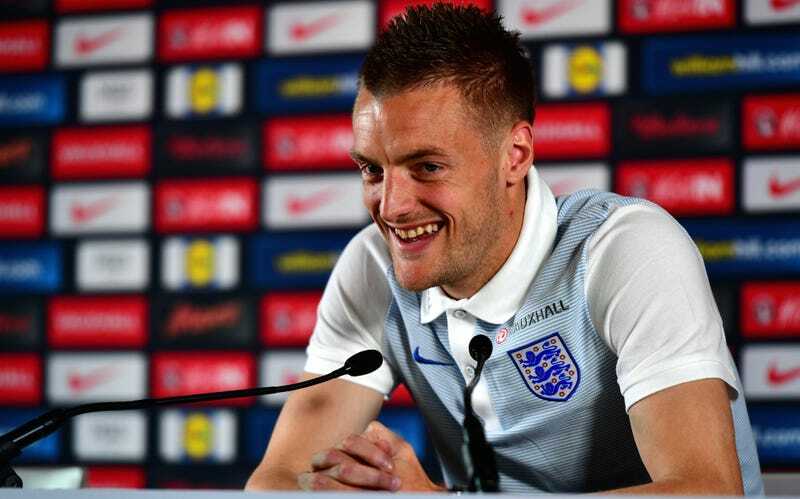 Despite speculation that Vardy would make a quick decision to settle his future before he headed to France with the England squad for Euro 2016, the story went cold soon after breaking. This didn’t appear to be good news for Arsenal, since you’d figure that the more time Vardy sat and thought about it the likelier it was that he’d be persuaded to stay at Leicester. From the outset, the Leicester board made clear their determination to retain their most popular player. Earlier this week, Arsenal Manager Arsène Wenger hinted that he figured Vardy would reject the Gunners’ advances, and sure enough, Leicester announced today that the club and Vardy had agreed to a new contract in principle, which all but squashes any chance of the striker moving this summer. To a certain extent, this makes Arsenal look kind of bad. Not only has a highly-coveted target of theirs turned down the opportunity to play for the Gunners, the player snubbed the historically great and famous Arsenal for the relatively tiny Leicester City, and doing so almost certainly for a smaller salary. Vardy has obvious emotional ties to the club, his teammates, the manager, and the fan base, but you can’t help but wonder if he didn’t also think that Leicester offered him a better chance to win something as well. And regardless, that Arsenal would submit a fairly sizable bid for a player, tying up that money until they received a definitive answer, all without knowing for sure whether the player was actually even all that interested in joining the club comes off like some serious mismanagement. However, Arsenal shouldn’t quite be considered a laughingstock for this. Vardy is a proven Premier League goal scorer who would’ve offered Arsenal a different skill set as the presumed new starter at a position of need, and all for just £20 million or so. Even if Wenger didn’t have a rock-solid commitment from Vardy that the Englishman would sign with Arsenal if they came for him, it was probably worth the gamble to make a run at him if the manager truly believed that Vardy was the missing piece in what he hopes will be a championship team next season. Better to swing and miss than not swing at all. Leicester fans are likely overjoyed with this news, and for good reason. While no one expects the Foxes to come anywhere close to replicating their magical 2015-16 season, the very least fans could’ve hoped to see was their beloved team reassembled more or less in tact next season to put on a brave defense of their title along with a fight in the Champions League. Since Vardy is the fan favorite of Leicester’s Vardy-Riyad Mahrez-N’Golo Kanté Big Three, retaining his services was arguably more important to fans than any other. Plus, the aging Englishman leaving for greener pastures—he with the least potential value on the transfer market of the three—could’ve sparked an exodus of sorts among Leicester’s other stars after they’d seen the writing on the wall. Thus for economic, sentimental, and sporting reasons, you can see why the club would give Vardy another raise on top of the one they gave him in February to keep him in town, even if cashing in on an older player would’ve possibly been a smarter decision from a more cut-throat perspective. Only time will tell if this was a good decision for Vardy. He is 29 years old, at a career apex that even he never would’ve imagined he’d reach, playing for a club whose spirit he embodies. However, he won’t stay at this peak for long, and he probably will never experience a season as personally and collectively successful as the one he’s just completed for Leicester. Of course, it’s not like Arsenal is the place for surefire goals and minutes and trophies, either. It’s perfectly reasonable if he suspected that an extended Leicester career would bring him more glory than a new Arsenal one.